It definitely doesn't come from a particularly credible source (I F***ing Love Science), but I'm curious if that picture is genuine. My mother claims that the legs, wings and head appear "unnaturally twisted" based on her past experience caring for Eagles and other raptors. This image can be attributed to Pam Mullens a Canadian wildlife photographer sometimes going by the pseudonym EagleHunter. 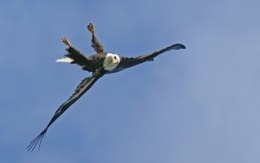 This image and other photos of eagles flying in interesting and unusual poses can be found on the eagle page of her portfolio site. I can tell you this image is real and not doctored in anyway. I have spent many years with Eagles and this air flip is something they do when hunting, it's not flying upside down, it is a flip that happens in a matter of seconds. 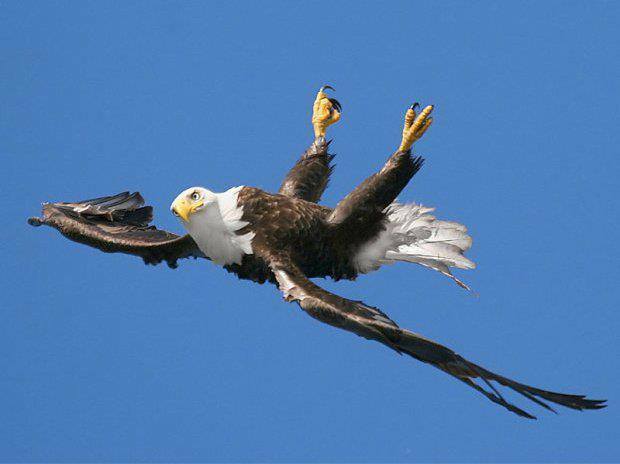 It's definitely possible for an eagle to be upside down during flight. 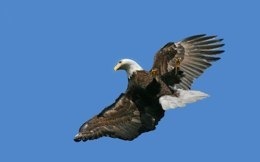 Here's a Youtube video titled "Bald Eagle barrel roll". 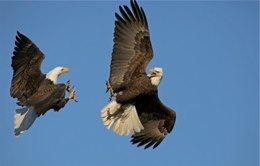 It shows some eagles playing or fighting or something and doing barrel1 rolls in the process. 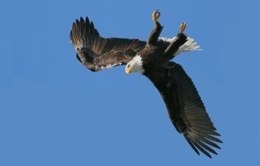 The picture you found could just be a well-timed photograph that happened during the middle of this eagle's roll. Here's a gif showing a closer shot of a bird doing a roll mid-flight. 1. Might not technically be barrel rolls, but that doesn't really matter. You get the idea. Whiffling is a term used in ornithology to describe the behavior whereby a bird rapidily descends with a zig-zagging, side-slipping motion. Sometimes to whiffle, a bird flies briefly with its body turned upside down but with its neck and head twisted 180 degrees around in a normal position. ... 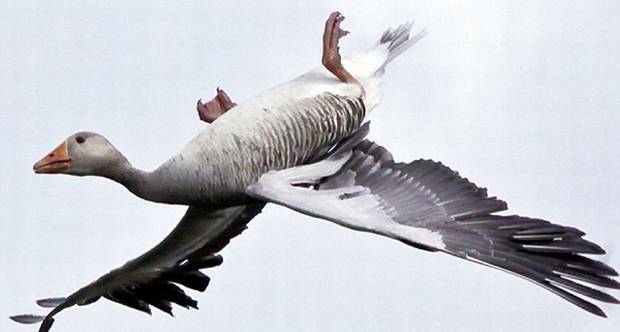 This erratic motion resembles a falling leaf, and is used to avoid avian predators or may be used by geese (family Anatidae) to avoid a long, slow descent over an area where wildfowling is practised. I've seen it quite often, usually (in the case of our pond) when geese are coming in over high trees and want to lose altitude rapidly without gaining (much) airspeed. Apparently eagles do it for play/fighting (notice how the bird that rolls inverted sticks his legs up with talons extended). Kinda fun to watch. Not the answer you're looking for? Browse other questions tagged biology photography birds . Is the intelligence of people going down? Is this picture of Rachel Dolezal reading a book called “How to be Black” genuine? Is this picture of UPS man with burning Twin Towers in the background genuine? Is this picture of a bent propeller genuine? Is this photo of a person with Ukrainian flags, swastikas, and a Super Mario T-shirt genuine? Is this a declassified photo? Is this photo depicting Dalits from India genuine? Is this a genuine photo of the supermoon over Gdańsk?